Salesforce provide functionality through which you can create single VF page and that can be translated in different languages based on language or locale preference of current logged in user. You need to upload the translation of all custom fields which you are going to use in VF page and can utilize custom labels to display warning, error information on VF page. In order to render the VF page in particular language, use Language attribute on <apex:page> tag. You can also bind this values with controller variable so that you can render VF page in different language. I have created a very simple VF page to illustrate this functionality by displaying account information. I have dropdown on VF page through which user will select language and VF page will re render to display page in selected language. If you are displaying page message using <apex:pageMessages>, then use custom label on apex class to display message. Upload all translation for custom label in salesforce. For custom fields also you need to upload language translation. Please refer Translation Workbench under Set Up. The language attribute does accept ISO country codes plus an optional locale like en,en_US,de,de_DE etc. For displaying header or pageblock section title, use custom labels. Lightning Data Service is used to load, create, edit, or delete a record in Lightning component, without using server side Apex code. Lightning Data Service takes care of sharing rules and field-level security. force:recordPreview has been deprecated. Now use force:recordData instead of force:recordPreview. targetFields attribute is added to force:recordData, which is populated with a simplified view of the record’s fields. targetFields is automatically updated a record changes. The targetRecord attribute of force:recordData, has been updated to return records in a new format. The following example shows the targetFields attribute within the force:recordData component. Lightning framework also support component inheritance in same way as it is supported in Apex. Consider a scenario in which you have many components which call server side apex controller method from their helper function. So instead of writing callToServer method in all components helper function, you can create a component and mark it as extensible component and write callToServer function in helper function. Now in all your components, extends this component and on any action just call callToServer function. In order to mark any component as extensible, just specify extensible="true" in component attribute. If you want to inherit any extensible component, then specify component name in extends attribute in component like extends="c:SK_CallToServerUtility". Please refer below code to have better understanding about inheritance in lightning components. I have created SK_AccountList component which will initially display latest 100 account records by calling callToServer function in doInit function. When user enter some search string and click search account, then table will display account records with name matching with search string again by calling callToServer function present in SK_CallToServerUtility component which is inherited by SK_AccountList component. Also in SK_AccountList component, we are setting the attribute value("msg") of SK_CallToServer component. Hope this will help in basic understanding of how to use inheritance in Lightning Components!! Looking forward for everyone's comments and feeback. 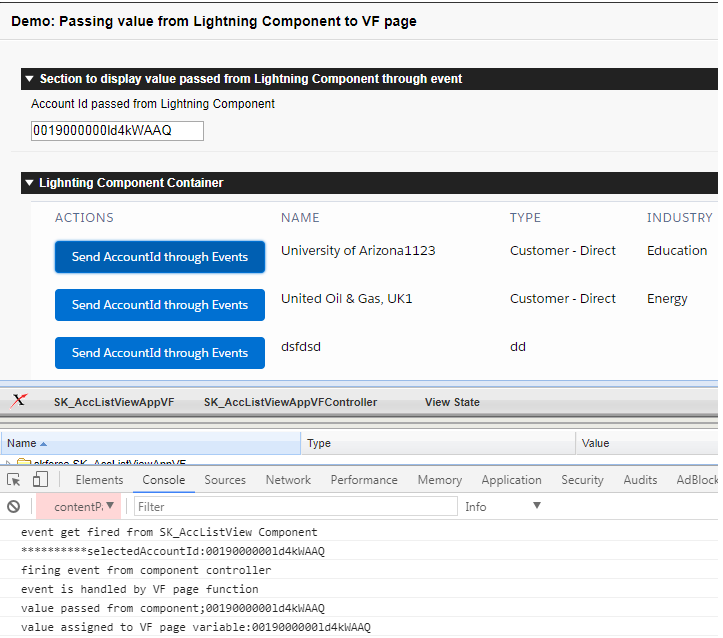 In this blog, I am going to explain the way through which you can pass parameter from Lightning component by firing event from it and handling it in VF page and display the passed parameter in VF page. 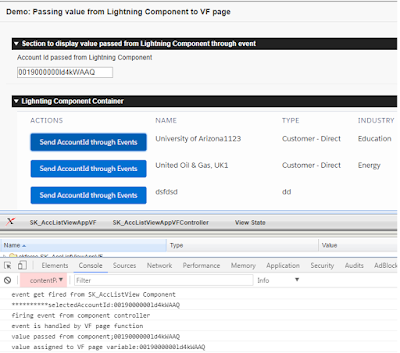 I have created a VF page which contains input text which will display Account Id which will be passed from Lightning component. This VF page also contains div container which will display lightning app which contains our lightning component.